The Academic Services office helps students become reflective and independent learners so that they may meet with success in their studies. 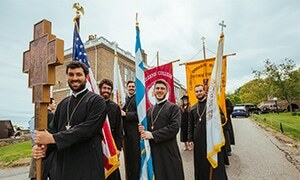 The office provides support to all students enrolled at Hellenic College Holy Cross. Academic counseling sessions offer strategies and interventions to help students be active in their learning. Campus-wide workshops are presented on a variety of study topics. The office is located in the Classroom Building, room 115, ext. 1202. One-on-one focused sessions are offered to help students develop a study plan that works best for them. Each appointment is one-half hour. Peer tutors are available to meet with students individually. Subjects include Greek, writing, and mathematics. Students who are on academic probation meet with the academic counselor on a weekly basis to identify areas of strength and areas that need improvement in order to increase their GPA and meet with success. Students enrolled in the First Year Academic Success Program will meet with the academic counselor each week to review their progress and make any necessary interventions in their study plans. Students who have documented disabilities that impact their learning will be given accommodations to facilitate classroom learning. Specific guidelines must be followed in order to receive these accommodations.